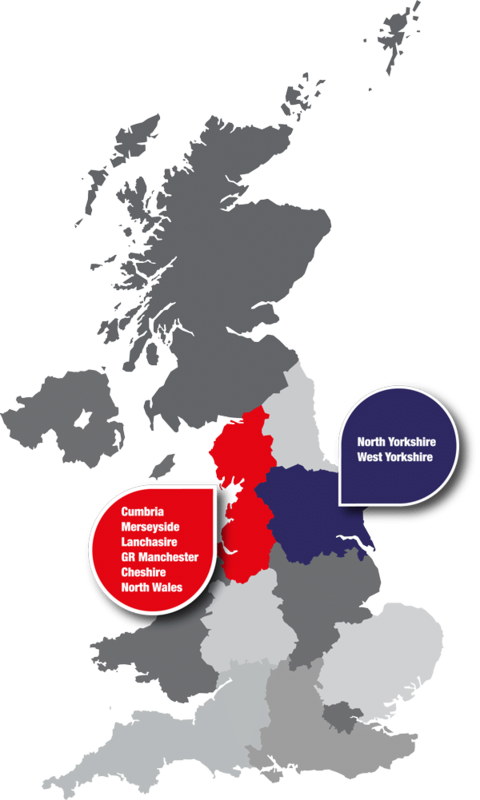 We cover the following areas across the North West and the North East of England. With over 25 years’ experience in Home Improvements across the North West and the North East. We continually offer one of the best energy rated window systems on the market and one of the most aesthetically pleasing windows in your area. Aluminium windows and uPVC windows, Composite doors, conservatories, orangeries, porches and much more. All our product offered are perfect for any home and with budgets and finance options that will suit you. Our products are created with you the homeowner in mind. St Helens Windows main office is situated in St Helens, but with a large team of estimators, surveyors and fitters we serve the whole of the North West and North East, including Merseyside, Lancashire, Greater Manchester, North Yorkshire, West Yorkshire, Cheshire, Cumbria and North Wales and the surrounding areas. If you would like to see the areas we cover within the following regions, please click on one of the icon areas below. We have Home Improvements Advisors in these areas on a regular basis and they are always more than happy to discuss your needs. Call 01744 611 203 and speak with one of our friendly Home Improvements Advisers today and arrange an appointment to suit you.